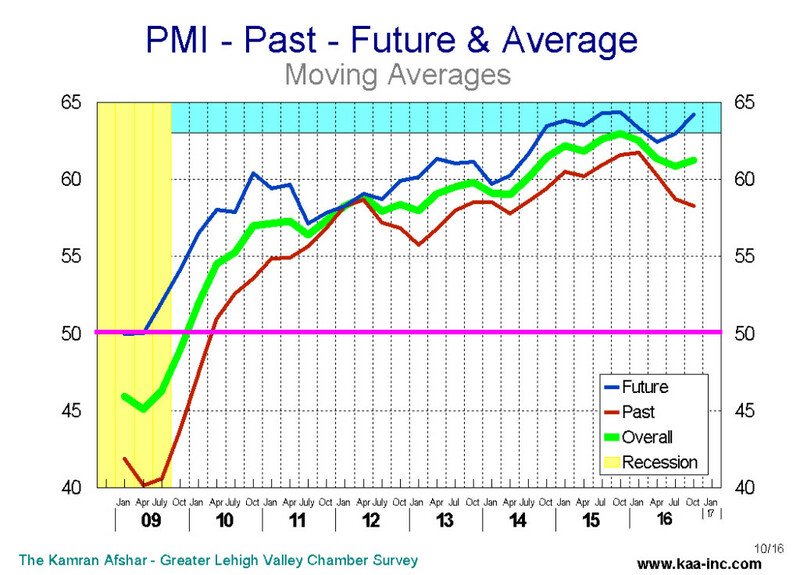 The Kamran Afshar- Greater Lehigh Valley Chamber of Commerce survey of Lehigh Valley businesses is done on a quarterly basis. In October we conducted our 68th quarterly survey of these series, and according to the survey, business sentiment and the overall confidence in the local economy rose slightly over its July level. Almost all of the increase was due to a sizeable expansion in business plans for future purchases. It should be noted that this survey was completed by October 19th, almost 3 weeks before the election. In October, the index of plans for purchases over the next 6 months leaped by 10% above its July’s level, bring it to its highest level in the last 6 years. And of equal importance is that this index has now moved into the range that is historically associated with strong growth. Businesses with 21 to 50 employees have the lead in the October survey, where 45% of them are planning to increase their expenditures, while only 3% are planning cutbacks. 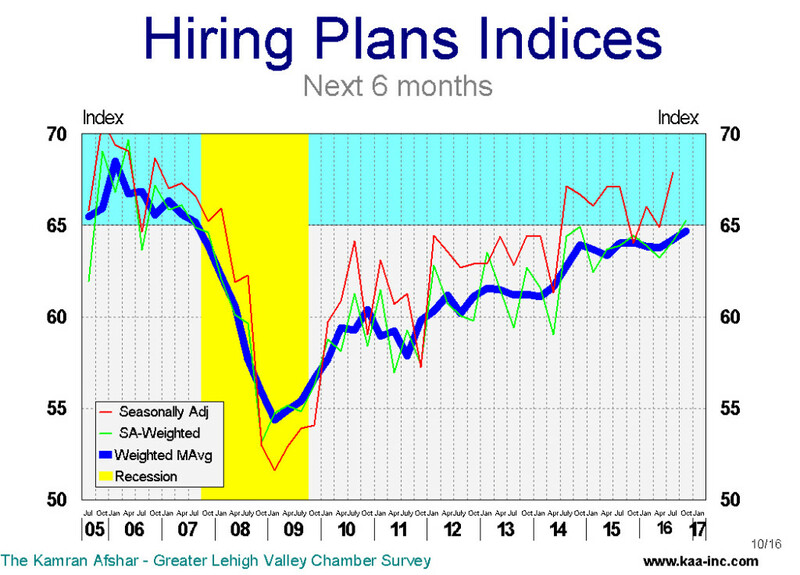 Hiring plans index for the next 6 months, is a shade higher than its July level, it has been very slowly moving up over the last 3 years and it is now at its highest level since April 2007, before the Great Recession. A third of local businesses are planning to hire more people, while 7% of them plan to lay off employees in the next 6 months. The layoff plans are now similar to what they were before the recession. The average business participating in the survey is planning to hire 1.1 new employees in the next 6 months. 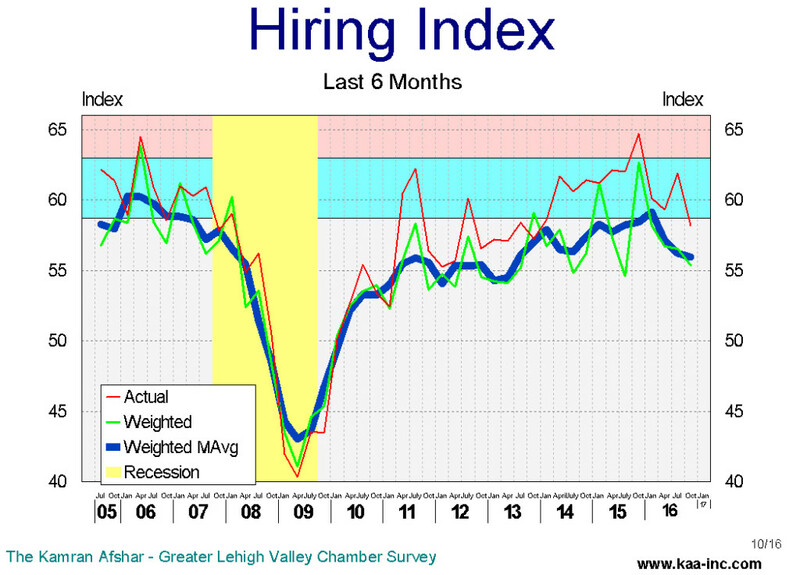 While this is a significant increase over what local businesses were planning to hire back in 2013, it is just slightly higher than their plans were in 2014 or 2015. Businesses with 51 to 100 employees lead to quest for hiring more people in the next 6 months. 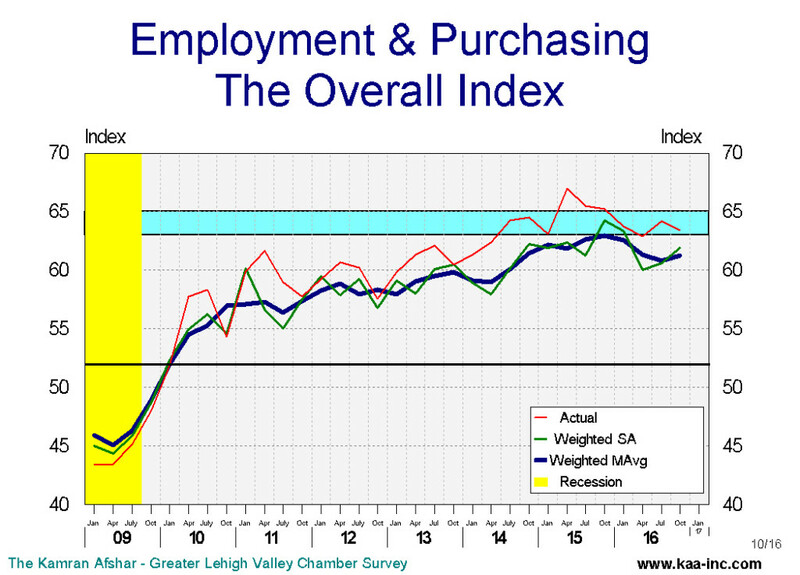 Businesses with less than 6 employees, which constitute half of all businesses in the Valley, show the lowest desire to increase employment in the near future. Lehigh Valley businesses have slightly reduced their pace of hiring over the last 12 months. This is normal in a recovery; when a recovery starts, employers need all kinds of employees and the pool of unemployed is deep and filled with variety of skills. As a recovery matures, with employers having filled their general needs, are then looking for more specific skill sets. However, as a recovery matures the pool of labor becomes much shallower with significantly less variety. That’s why right now in the Valley, a number of employers cannot find the particular skills they are looking for. And this is not limited to high tech jobs, welders as well as many other low tech vacancies are left unfilled due to lack of qualified applicants. This has contributed to the small drop in the number new hires. The average business participating in the survey hired 0.6 new employees over the last 6 months. Companies with 11 to 20 employees led the group in new hires, and those with fewer than 6 employees were last on the list with a net zero addition to their employment ranks. 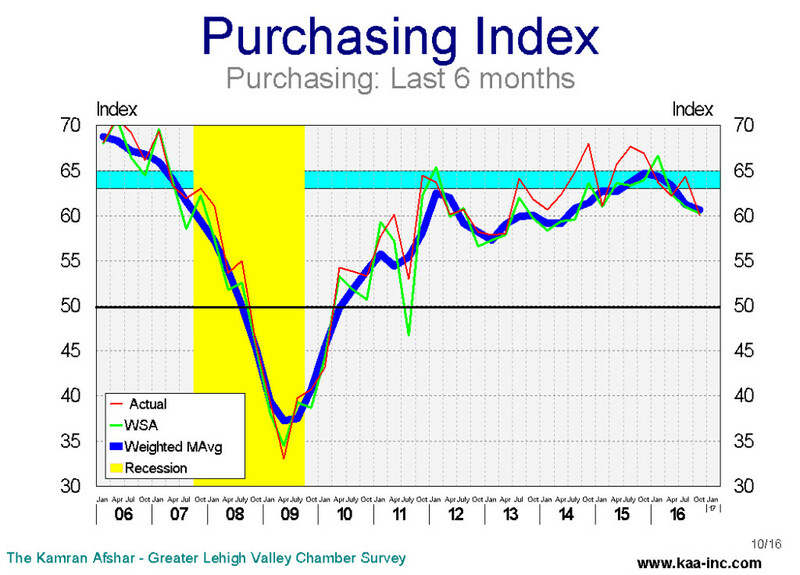 The index of actual purchasing has dropped 6% below its last year’s level. It should be noted that, overall, local businesses are increasing the amount of money they spent on purchases in the Valley. Over the last 6 months 36% of the local businesses increased their expenditures in the last 6 months while 16% reduced theirs, which means a net 20% of local business increased their expenditures over the last 6 months. The decline, is only relative, in October of 2015 a net 28% of local businesses increased their expenditures. And the decline, particularly in October was almost entirely due to the cutback in expenditures by companies which have between 51 to 100 employees. This has had a large impact since companies this size had been in the forefront of growth, particularly in the recent years. It should be noted that businesses with 51 to 100 employee participating in our survey are also the only category in the survey that has reported a decline in revenues over the last 6 months. The average business participating in our survey increased its expenditures, by 3% in the last 6 months. The index of actual revenues over the last 6 months has shown a small but steady decline this year. The October decline, not surprisingly, was entirely due to a drop in revenues of companies with between 51 to 100 employees. However, businesses with more than 100 employees reported the largest increase in their revenues in October. They were followed by those with 21 to 50 employees. The index of expected future revenues, while oscillating widely, is continuing on a relatively flat trajectory. Businesses with 21 to 50 employees expecting to see the largest increase in the near future, with 69% of them expecting higher revenues while only 10% of them expect to see a drop. And interestingly enough, companies with 51 to 100 employees which were the only size companies who reported a drop in revenues over the last 6 months, overwhelmingly expect to see a significant increase in their revenues over the next 6 months. The October data shows an interesting split between the expectation of future and assessment of the past before the election. The split appears to be correlated with the level of uncertainty before the election. Business planning usually has very little to do with party politics. 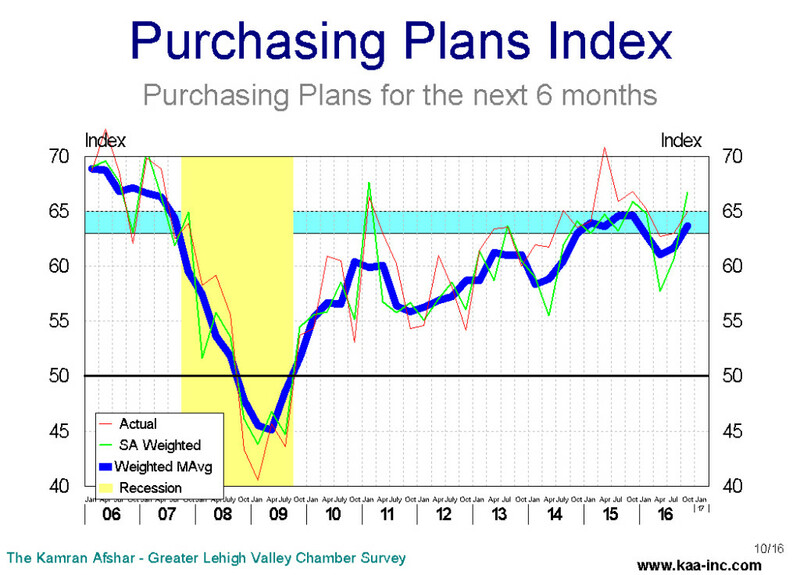 Business planning is about expected costs and projected revenues in the months to come. Both business costs and revenues are impacted by government policies. However, since businesses only know about the generalities of the new administration’s healthcare, tax, business and trade policies. Even those who enthusiastically welcome the change, don’t exactly know what are the new administration’s policies. In absence of specifics, time tables, congressional role, etc. business planning faces serious limitations. Similar to the period before the election, the uncertainty creates a wait and see attitude among businesses who will try to err on the side of caution. They have to wait until the new administration actually formulates its policies and then push them through either executive orders or the congress. If this process appears to be taking a long time, it will negatively impact the economic growth. On the other hand, if the new administration appears to be ahead of the game and formulates its policies rapidly, it may have a positive effect on economic growth. We will find out the answers to these questions in the next few months.